Grapids Heating & Cooling, Inc. Precision Heating & Cooling, Inc.
Grand Rapids, Michigan gets nearly 50 more inches of snow each year than the average city in the United States. As a result, the installation and servicing of furnaces and heating systems of residents in this bustling city keep mechanics and HVAC contractors busy throughout the year when temperatures drop. Having many heating and furnace contractors to choose, residents can expect a variety of options when hiring a professional to service or install their heating systems or furnaces. From the surrounding agricultural areas and hardwood forests to the city center, Grand Rapids is a hub for western Michigan's cultural and business activities. It is less vulnerable to the volatility of the automotive industry than areas farther east, and it offers an extensive array of arts and entertainment venues and amenities. Trulia lists Grand Rapids among the top three markets to watch in 2016 based on factors such as job growth and affordability. Below is a list of five of the most popular neighborhoods in Grand Rapids, all of which are serviced by heating and furnace systems contractors. Creston — The Creston neighborhood is one of the largest in Grand Rapids, situated approximately 2 miles north of the downtown area. Residents enjoy a low cost of living and amenities including parks, shops, grocery stores, and restaurants. Typical household incomes are approximately 18 percent higher than the median household income for the city. Westside Connection — Westside Connection is another large neighborhood in Grand Rapids. Residents only need to travel approximately 5 miles to get downtown, although there are abundant amenities located within the neighborhood. With a median household income over 43 percent higher than the average for Grand Rapids, Westside Connection is also among the more affluent areas of the city. The neighborhood contains a mixture of single-family homes and condominiums. Eastgate — In early 2016, housing prices began rising in Eastgate, one of the smaller neighborhoods located 5 miles east of the city center. This quaint neighborhood is peppered with split-level single-family homes, restaurants, and shops. Ridgemoor — Ridgemoor is among the top neighborhoods in Grand Rapids thanks to its ample amenities, low cost of living, and stable housing market. The housing market offers a combination of single-family homes and condominiums, making it an ideal neighborhood for families and young professionals. Alger Heights — Trulia lists Alger Heights among the top five most popular neighborhoods in Grand Rapids. Residents only need to travel a short distance to get downtown, and they enjoy benefits including nearby parks, markets, and restaurants. The neighborhood encompasses a quaint variety of bungalows, Cape Cod-style houses, and two-story single-family homes. Keeping a furnace working smoothly is essential in the fall and winter climates of Grand Rapids. Costs can vary widely depending on the scope of the project. For example, installing electric baseboard or wall heaters costs an average of $633, with most homeowners spending between $345 and $932. Installing or replacing a heat pump costs an average of $5,270, while installing a radiant heating system costs an average of $3,311. The table below lists other common furnace and heating repairs performed in Grand Rapids with a comparison between local costs and the national average. Although some services, such as duct or vent cleaning, cost nearly the same as the national average, others cost substantially less in Grand Rapids. Furnace installation, for example, costs more than $1,000 less than the national average. The state of Michigan requires mechanics who work on residential buildings or both residential and commercial buildings to have contractor's licenses. This includes anyone working on HVAC equipment, ductwork, limited or unlimited heating services, or hydronic heating systems. Additionally, the Michigan Department of Labor's Bureau of Construction Codes and Board of Mechanical Rules require a specialty license for anyone working with liquid propane tanks and pipes, gas piping, gas piping and venting, underground tanks and pipes, solid fuel, or solar systems. Consumers can verify that a tradesman or contractor has a license by searching http://www.cis.state.mi.us/verify.htm. Having insurance typically makes heating and furnace contractors more appealing to customers, many of whom expect contractors to have liability insurance. At minimum, contractors should have four major insurances to protect their businesses, employees, and clients: property, liability, workers' compensation, and automobile. Contractors should check with the state to determine the required workers' compensation coverage. With an average snowfall of 73 inches per year and January temperatures hitting average lows of 16 degrees Fahrenheit, efficient furnaces and operational heating systems are crucial to Grand Rapids residents' comfort and well-being. Buyers and renters expect their homes to be safe.This is usually the highest priority in cold cities like this and thus could affect home values more if it's not new or functioning properly. Keep everything working smoothly by finding a licensed, insured professional to complete any necessary installation and repairs. 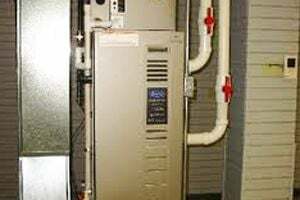 In addition to handling necessary planning and permits, Grand Rapids heating and furnace service contractors have the experience and knowledge necessary to ensure the work is done correctly. Comment: we would like to replace our old furnace please. Grand Rapids Heating & Furnace Contractors are rated 4.83 out of 5 based on 775 reviews of 16 pros. Not Looking for Heating & Furnace Systems Contractors in Grand Rapids, MI?